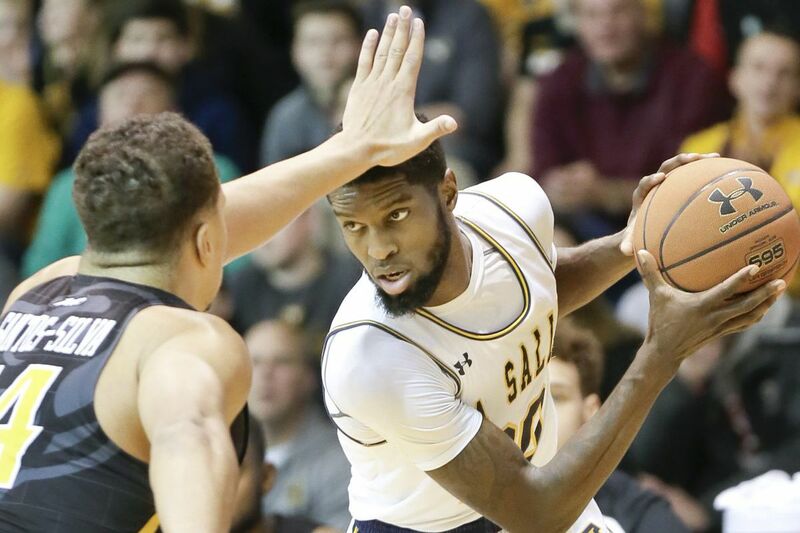 VCU's Marcus Santos-Silva and La Salle's B.J. Johnson go head-to-head in the first half Saturday. B.J. Johnson, the Atlantic Ten's leading scorer, tried his best when he returned to the Explorers' lineup Saturday after missing three games with an ankle injury, but he just ran out of gas, sitting the final six minutes of his team's 80-74 loss at home to VCU. "He had not played basketball for three weeks," coach John Giannini said. "He had done some drills but he hasn't played basketball for three weeks. He did his best in the first half and really could not be effective in the second half. So it was as simple as that." Giannini added that Johnson is not back to 100 percent yet. The coach considers him day-to-day as the team prepares for Wednesday night's game at UMass. Johnson shot 5 of 16 against the Rams, scoring 15 points to go with seven rebounds and four steals. The Explorers were 1-2 in the three games Johnson missed. It's a big loss considering his ability to score (21.2 points per game) and rebound (8.9 per game). Wednesday at Massachusetts, 7 p.m.
Saturday at Duquesne, 12:30 p.m.
A look at the statistics through three Big East games shows some amazing numbers for the Wildcats at both end of the spectrum. Averaging a league-best 98.7 points per game, the Cats have committed a total of 20 turnovers in the three contests, an average of 6.7. Their turnover margin is plus-7.33 and their assist-to-turnover ratio is 2.9 to 1, with Phil Booth leading the way at 14 assists and one turnover. But Villanova has been badly outplayed on the boards, getting outrebounded in all three games. The Cats sport a rebound margin of minus-12.7 and are next-to-last in offensive rebounds at 7.3 per game. They grabbed five offensive boards last Saturday to Marquette's 16 and were outscored by 22-11 in second-chance points. Wednesday vs. Xavier (Wells Fargo Center), 8 p.m.
Saturday at St. John's (Madison Square Garden), 8 p.m.
After averaging 12 minutes per game off the bench last season, junior center Max Rothschild has become a valuable piece of the Quakers' starting lineup thus far, as evidenced by his line of 10 points, six rebounds and five assists in Saturday's win over Princeton. "Max is a real good poster child for what we're trying to do here," coach Steve Donahue said. "Last year, he'd play four minutes one game, 12 the other, and now he goes and plays 34 [vs. Princeton] and it just makes us a bigger, tougher team. I'm real proud of him. I'm proud of all the guys." A 6-foot-8 junior, Rothschild leads the team in field goal percentage (52) and rebounding (6.6 per game), forming a nice tandem under the boards with 6-8 sophomore A.J. Brodeur. He's also averaging 9.1 points and 2.2 assists. Friday vs. Cornell, 8 p.m.
Saturday vs. Columbia, 7 p.m.
Shavar Newkirk is less than a year off surgery for a torn anterior cruciate ligament and Hawks coach Phil Martelli said, "I couldn't ride him hard like I do with a senior point guard. I was kind of nurturing him along." Now Newkirk is playing more minutes and showing leadership traits that have met with his coach's approval. "He was telling me, 'Let's run this, let's run that,'" Martelli said after Saturday night's victory over St. Bonaventure. "When I wanted to bite Taylor Funk's head off for missing two free throws, Shavar was like, 'Coach, I got him.' So that's the kind of thing. But he's been that way in practice." After Martelli told Newkirk, "You played a lousy game" in a Dec. 30 loss at George Washington, the player told his coach, "I'll be in Monday, we're going to watch film." Martelli said Newkirk has never suggested that before and called it "a huge step." Newkirk had 23 points, 10 rebounds, five assists and five steals against the Bonnies. Wednesday at George Mason, 7 p.m.
Sunday at Massachusetts, 5 p.m. The Dragons have seen players come and go because of injuries — only four players have competed in all 17 games — but coach Zach Spiker hopes that settling into a steady CAA schedule of games on Thursdays and Saturdays will give his team some consistent practice time. "The more we practice, the more we work, the more comfortable we are playing with each other," Spiker said. "It's frustrating to not have as much continuity as we'd like to have at this point in the year. It's almost like we're starting the year now." In recent weeks, the Dragons have welcomed back guards Troy Harper (shoulder) and Miles Overton (calf) from injuries. Guard Tramaine Isabell, the team's top scorer with an 18.6-point average, is playing despite a lower body injury and "is not 100 percent," Spiker said. Reserve big man Tyshawn Miles has missed the last four games with an injury. Thursday at Delaware, 7 p.m.
Saturday vs. Hofstra, 4 p.m. The Owls have lost five straight. They followed a near-upset of then-No. 19 Cincinnati last week with a 60-39 loss at Central Florida, where they shot 32 percent, attempted only one free throw and turned the ball over an uncharacteristic 19 times, more than eight over their average. "We're in a tough stretch, there's no question about it," coach Fran Dunphy said. "We just have to keep plugging away. I don't know any other way to get out of it than to work through it." Temple has used the same starting five for all 15 of its games. Asked if he would make any changes, Dunphy hinted at some adjustments down the stretch. "The starting piece is something that I think people sometimes will fixate on," he said. "I would prefer to fixate on the ending piece — who are the guys that are there for crunch time? Those are the things that will change a little bit." Wednesday at SMU, 9 p.m.
Saturday vs. Memphis, 2 p.m.